16 w w w. s p i r i t o f w o m e n . c o m | W I N T E R 2 0 1 8 | S P I R I T O F W O M E N Healthy Living A t age 19, snowboarder Amy Purdy unexpectedly lost both her lower legs after a bout with near- fatal bacterial meningitis. What Purdy didn't lose, however, was her capacity to visualize a new athletic future for herself unhindered by her double amputation. "You have to see yourself accomplishing a goal, big or small. When you can get excited about it, then it becomes possible to accomplish," says 38-year-old Purdy, today one of the top-ranked adaptive snowboarders in the world, a Paralympic bronze medalist and the only double-leg amputee competing in snowboarding at the world-class level. "With any type of performance, I spend a lot of time first visualizing it from start to finish before even stepping on stage or the start gates. If you can see it and you can believe it, then you can achieve it." In fact, Purdy says she's currently doing "as much mental training as possible" for the March 2018 Winter Paralympics in South Korea, in addition to dry land and snow workouts. "Mental training is just as important or more [important] than physical, and going into these games I'm working hard to make sure my mindset is where it needs to be to succeed," she says. Mind over matter Using mental energy to adapt to her body's limitations has been Purdy's strategy since she first designed her own prosthetic legs after being unable to find existing models that would work for snowboarding. And when she's not actively training for competition, she still follows a modified exercise regimen to keep her body in peak form. "I used to work out really hard and lift heavy weights. I was in incredible shape, and that's what worked for me at the time, but I realize that I don't have the desire to crush myself that way anymore," says Purdy, who lives in Colorado with her husband, Daniel Gale. "I now focus on lighter workouts, building myself up safely to heavier weights and consistency. Typically, I train on snow with my organization Adaptive Action Sports that I founded with my husband. We are training multiple athletes and wounded veterans for the 2018 Paralympic Games. So I train with them for two to four hours each morning on snow, then we head to the gym where I work with my personal trainer for an hour." In addition to adding yoga and barre classes from time to time, Purdy looks back on her training for ABC-TV's "Dancing with the Stars" in 2014 as a great testimony to the power of dance as exercise. "It works all the muscle groups in different ways," she says. "I was stronger [during "Dancing with the Stars"] than I have ever been, even when weight training. You're stretching, burning calories and strengthening at the exact same time. It really is amazing." Global routines Purdy maintains a busy international travel schedule for competitions and corporate motivational speaking appearances, but she makes a point of sticking with a consistent lifestyle routine wherever she goes in the world. "If I'm at home or traveling, I tend to take baths at night with aromatherapy oils while either reading a book on mental training or listening to one on audio," she says. "When I get out of the bath, I do my best to not look at my phone or computer again before bed. It's like taking a bath is my indicator that it's time to shut down." Purdy says she also believes in focusing on a healthy diet—within reason. "I tend to eat clean fruits, veggies and protein, and limit sugar as much as possible," she says. "But I don't deprive myself. If I want pizza, then I eat it. If I want a donut, I eat it. I just don't make it a habit. I like eating nutritious food, and I look at it as fuel, so diet is key." Purdy says she'll be gathering all her physical and mental resources for the final sprint to the March Paralympics, but after that she plans to refocus on other aspects of her career, including a new YouTube banner she's launching next year. "I love my career and am always evolving it!" she says. 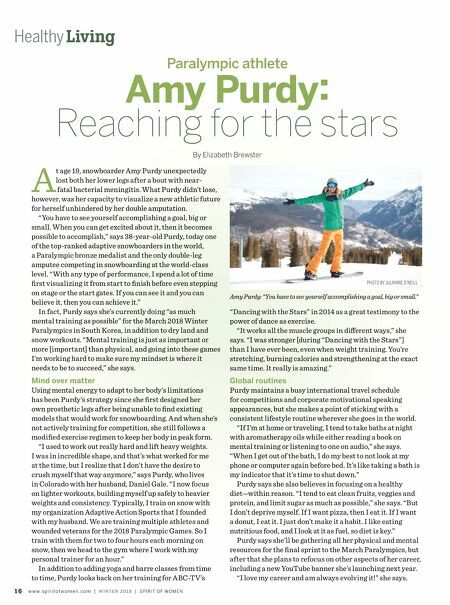 Amy Purdy : By Elizabeth Brewster Reaching for the stars PHOTO BY JULIANNE O'NEILL Paralympic athlete Amy Purdy: "You have to see yourself accomplishing a goal, big or small."